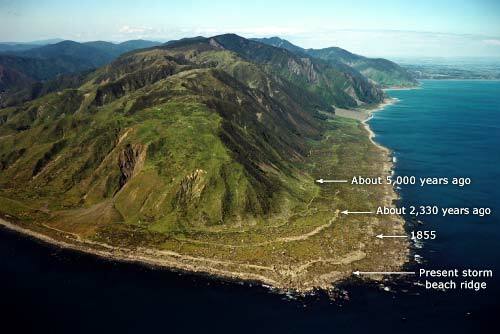 A series ridges or beaches at Turakirae Head, near Wellington, indicate the gradual uplift of the southern end of the Rimutaka Range during major earthquakes. Inland from the present beach is the ridge that was raised 6.4 metres in 1855. Further back is a beach dated about 2,300 years ago, and a faint ridge near the base of the hills is where the shoreline was about 5,000 years ago.